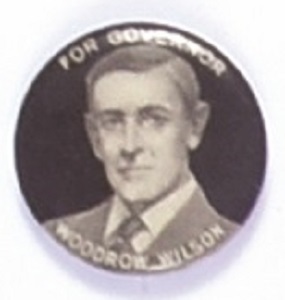 When Woodrow Wilson was elected governor of New Jersey in 1910, he broke a string of five consecutive Republican governors and immediately became a national figure. This rare 7/8 inch celluloid is from that 1910 campaign. The last one we sold went for more than $2,500. This one is in excellent condition with Whitehead and Hoag BP.